IMAGINE if Dr. Seuss wrote the patter for a "Monkey Bar" routine..
A Tantalizing Twisted and Ingeniously Insane routine that's prefect for MC's, comedy magicians, and any performer wanting to add a light moment (with a truly magical impact) to their shows! 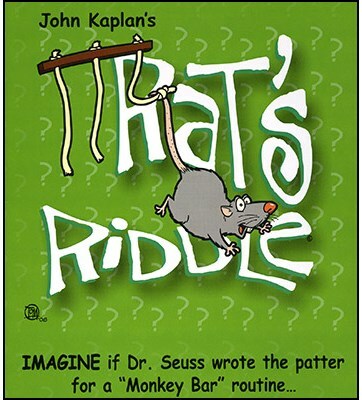 Right from the opening line, the whimsical rhyming patter hooks your audience as a rat jumps back and forth from each end of the stick..and winds up tied to the MIDDLE string for the routine's impossible finale! Easy and Fun to perform! Comes complete ready to perform with "Monkey Bar" prop (richly stained 9" hardwood, painstakingly handcrafted by a master finishing carpenter to which is attached a realistic rubber rat with a soft white rope), illustrated instructions, original rhyming patter with royalty free use performance rights certificate.